I am excited to announce the inauguration ceremony of Ngagyur Palyul ThubtenSedrup Choekhor Dargyeling, a new temple built at Bodh Gaya. 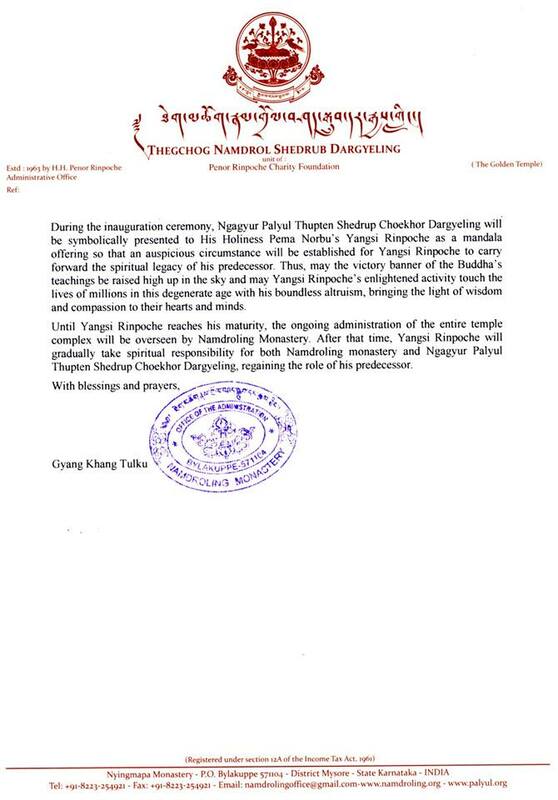 On behalf of Palyul Namdroling, I would like to invite you to take part in this important and auspicious celebration. 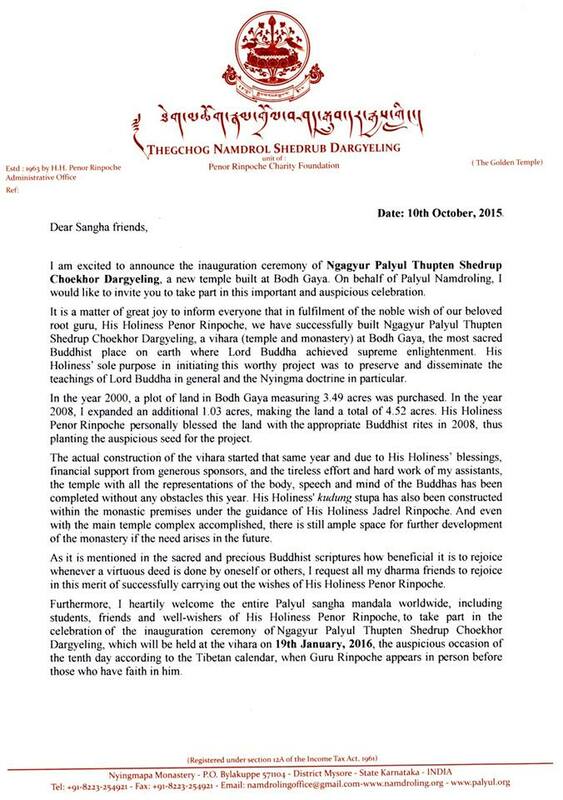 It is a matter of great joy to inform everyone that in fulfilment of the noble wish of our beloved root guru, His Holiness Penor Rinpoche, we have successfully built Ngagyur Palyul Thupten Shedrup Choekhor Dargyeling, a vihara (temple and monastery) at Bodh Gaya, the most sacred Buddhist place on earth where Lord Buddha achieved supreme enlightenment. His Holiness’ sole purpose in initiating this worthy project was to preserve and disseminate the teachings of Lord Buddha in general and the Nyingma doctrine in particular. In the year 2000, a plot of land in Bodh Gaya measuring 3.49 acres was purchased with another 1.03 acres annexed in 2008. His Holiness Penor Rinpoche personally blessed the land with the appropriate Buddhist rites in 2008 thus planting the auspicious seed for the project. The actual construction of the vihara started that same year and due to His Holiness’ blessings, financial support from generous sponsors, and the tireless effort and hard work of my assistants, the temple with all the representations of the body, speech and mind of the Buddhas has been completed without any obstacles this year. His Holiness’ kudung stupa has also been constructed within the monastic premises under the guidance of His Holiness Jadrel Rinpoche. And even with the main temple complex accomplished, there is still ample space for further development of the monastery if the need arises in the future. As it is mentioned in the sacred and precious Buddhist scriptures how beneficial it is to rejoice whenever a virtuous deed is done by oneself or others, I request all my dharma friends to rejoice in this merit of successfully carrying out the wishes of His Holiness Penor Rinpoche. Furthermore, I heartily welcome the entire Palyul sangha mandala worldwide, including students, friends and well-wishers of His Holiness Penor Rinpoche, to take part in the celebration of the auspicious inauguration ceremony of Palyul Thupten Sehdrup Choekhor Dargyeling, which will be held at the vihara on 19th January, 2016, the auspicoius occasion of the tenth day according to the Tibetan Calendar, when Guru Rinpoche appears before those who have faith in him. 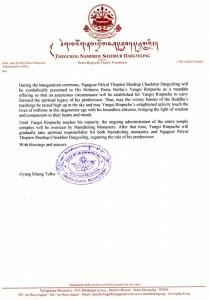 During the inauguration ceremony, Ngagyur Palyul Thupten Shedrup Choekhor Dargyeling will be symbolically presented to His Holiness Pema Norbu’s Yangsi Rinpoche as a mandala offering so that an auspicious circumstance will be established for Yangsi Rinpoche to carry forward the spiritual legacy of his predecessor. Thus, may the victory banner of the Buddha’s teachings be raised high up in the sky and may Yangsi Rinpoche’s enlightened activity touch the lives of millions in this degenerate age with his boundless altruism, bringing the light of wisdom and compassion to their hearts and minds. Until Yangsi Rinpoche reaches his maturity, the ongoing administration of the entire temple complex will be overseen by Namdroling Monastery. 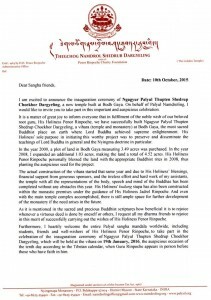 After that time, Yangsi Rinpoche will gradually take spiritual responsibility for both Namdroling Monastery and Ngagyur Palyul Thupten Shedrup Choekhor Dargyeling, regaining the role of his predecessor. This entry was posted on Wednesday, August 19th, 2015 at 04:43	and is filed under HE Khentul Gyangkhang Rinpoche, Namdroling, Uncategorized. You can follow any responses to this entry through the RSS 2.0 feed. Both comments and pings are currently closed.